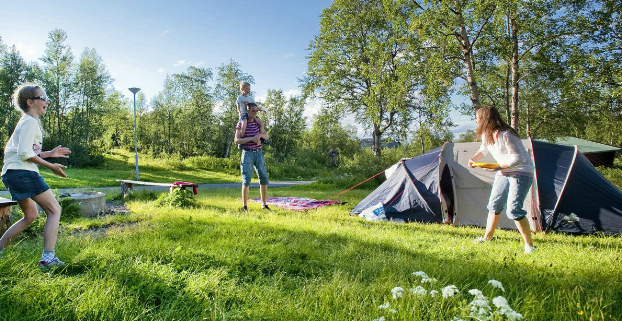 The Camp Ripan campsite is the ultimate solution if you want to experience magnificent scenery but still retain access to the shopping on offer in town. You stay in an area of great natural beauty in proximity to exercise trails and a wide range of activities. The campsite has space for 90 caravans and motorhomes, with pitches featuring an electric hook-up, and the site can accommodate an unlimited number of tents. There is also a service building featuring a kitchen, dining areas, laundry room, shower, sauna and toilets. Adjacent to Camp Ripan is the northernmost heated outdoor swimming pool in Sweden, as well as a spa, playground, mini golf course, restaurant and pub. The campsite is open from early spring until the autumn. The outdoor pool is open throughout the summer. Since Camp Ripan, and Kiruna as a whole, are located beyond the northern limits for cultivation, they have chosen not to have grass on their caravan pitches as it wears quickly, struggles to recover and becomes muddy. The surface used is therefore asphalt and gravel. There are also 28 caravan pitches with their own decking. When you book a pitch at Camp Ripan, it includes electricity, water, the emptying of black water and grey water, and access to the service building with kitchen facilities, toilets, showers and sauna. Price comment: Standard pitch: SEK 295/day Superior pitch: SEK 375/day (own decking and Wi-Fi).